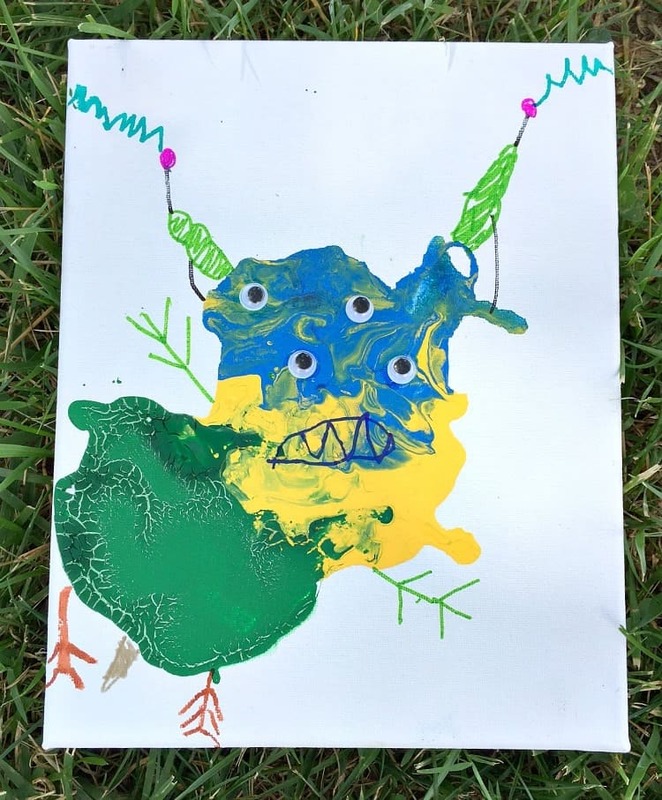 Let your kids’ imaginations run wild with this Easy Art Activity for Kids: Blow Paint Monsters! 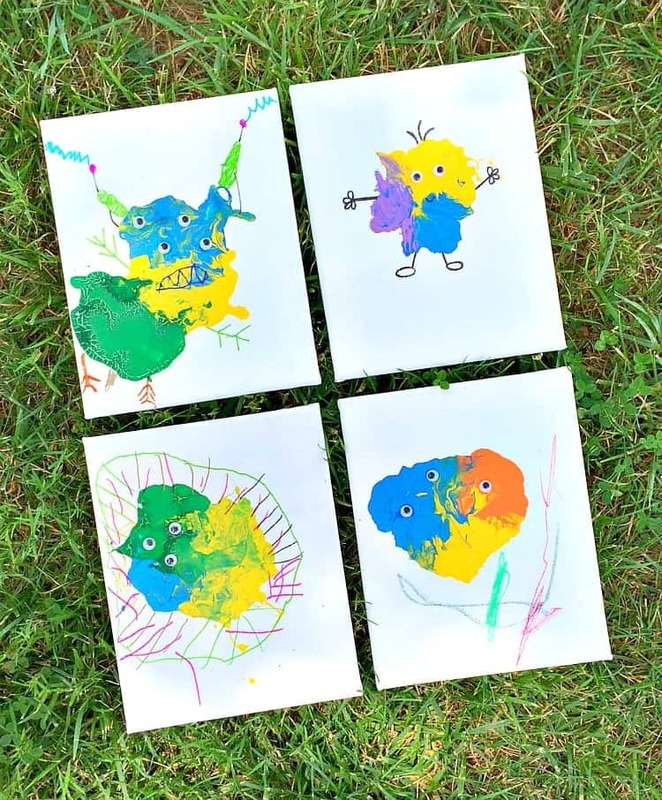 With some paint and a simple drinking straw, toddlers, preschoolers, and kindergarteners can create endless varieties of colorful and whimsical creatures! Hey, friends! With all 3 of my kids at home for the summer, I’ve had to get a little bit more creative with the ways that I keep them busy. But that doesn’t mean that we’re getting complicated — I only do EASY! I have the added challenge of finding activities that each of my boys (ages 2-6) can handle and enjoy. That means that any art project that we do should be pretty basic and customizable…allowing plenty of room for elaboration and creativity! 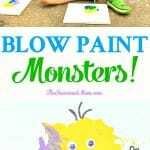 These Blow Paint Monsters are the perfect solution! A quick note: This is definitely a two-part process, so just plan for that in advance! The first step is to squeeze a good amount of paint on the center of the canvas or paper. I let each boy pick 3 colors to use for their monsters, but you could obviously stick with just one color or use even more. 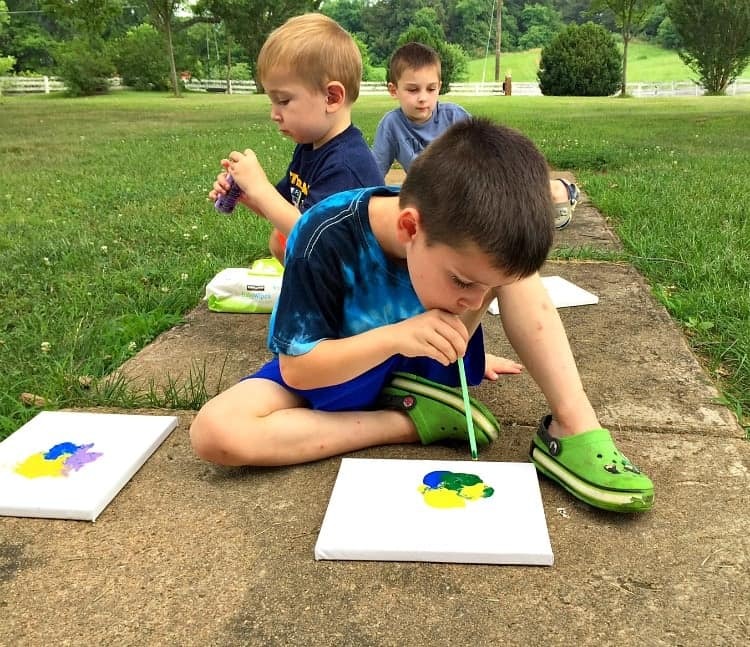 Then I gave each child a straw and showed them how to blow through the straw just above the paint, using the air to push the paint around the canvas. 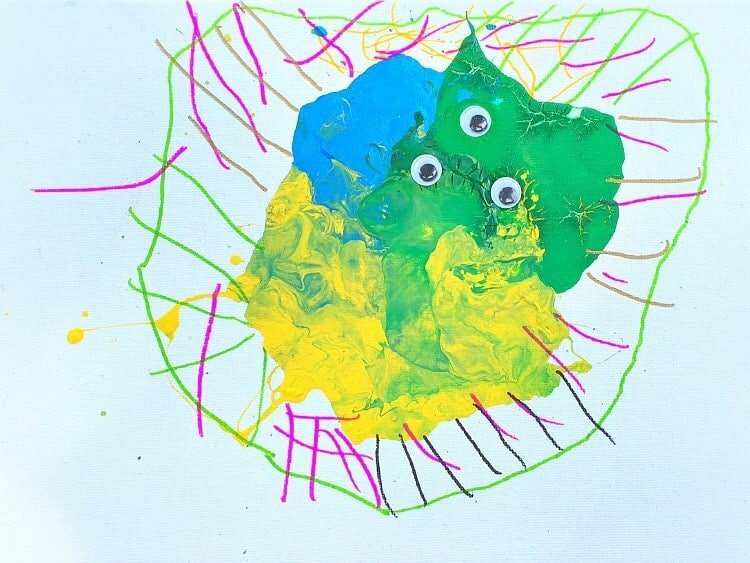 They could (somewhat) control the direction of the paint by the way that they moved their straws, making it fun to shape their creatures and mix the colors on their pages. Once we were happy with the way that our paint looked, I set the canvases aside to completely dry overnight. The next day I pulled out the eyes, glue, and markers to finish off our designs. It was fun to see the creatures that each of the kids envisioned! I was in charge of actually gluing the eyes onto the monsters (because I didn’t want the boys using the Super Glue), but they decided how many eyes their monsters would have, and exactly where each eyeball would go! Then they used the markers to give their colorful friends arms, legs, spikes, horns, etc. 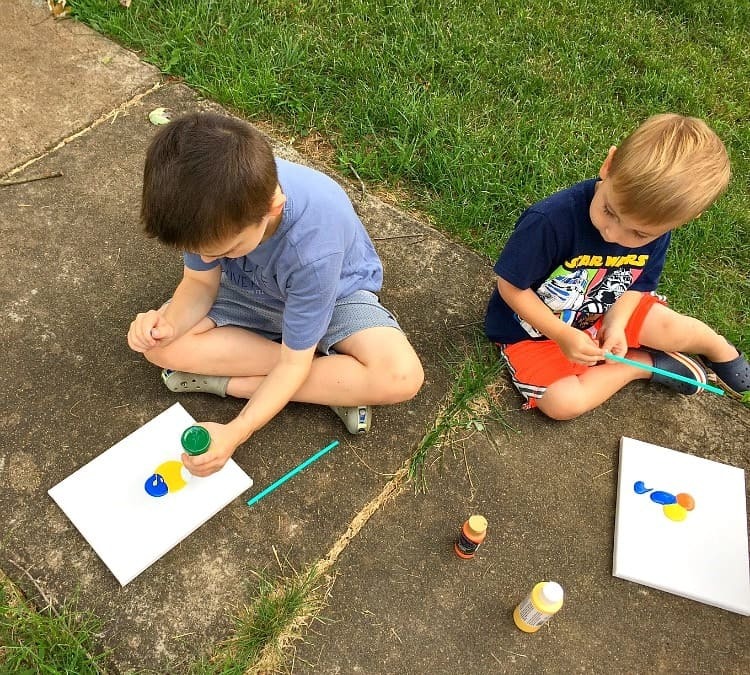 I hope that you get a chance to try this easy art activity for kids with your favorite little people! It’s a great way to tap into their creativity and entertain them for quite awhile! Enjoy! This is such a fun idea! 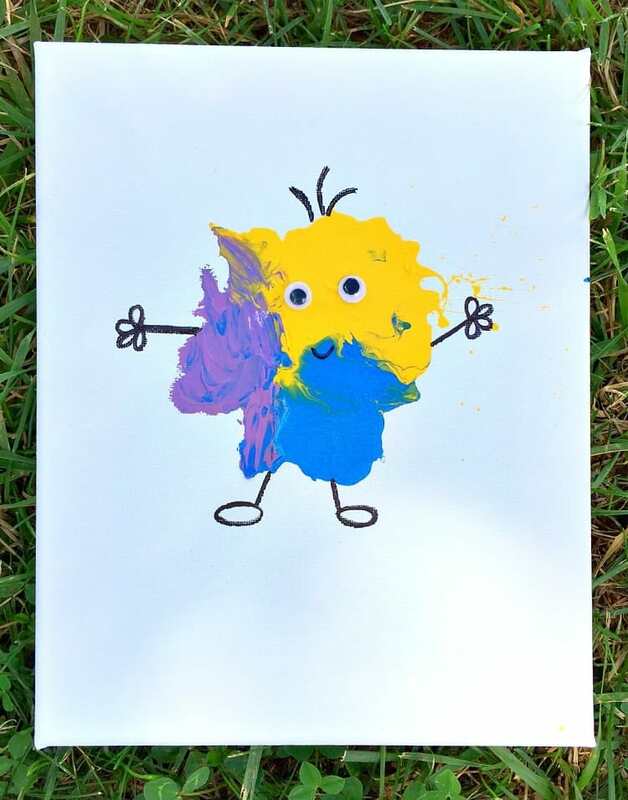 Blow paint is fun on its own but turning them into monsters is such a clever idea! This is such a neat little project! I’d love to try this one out with my four-year-old sometime. Looks like fun! Thanks for sharing cute idea! Thanks, Morgan! 🙂 I hope that you do! Great idea will try with 7 year old granddaughter! Blow paint is interesting. This is a great way to tap into creativity, as you share. Outstanding project so far I know, keep sharing your valuable thoughts, Thanks for your awesome paint. Love this art idea! 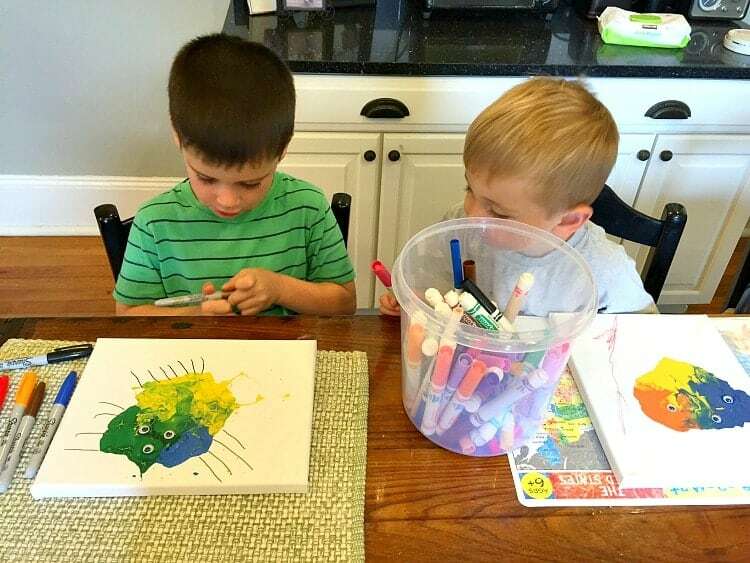 Another fun art concept to check out would be the Braintone Art Events, where kids and adults can both create art pieces with your brain waves! I remember using a straw to control the paint when I was a kid. We would put the paint on a T-shirt and then wear it the next day. The monsters turned out so cute!! I have tried this with my preschool classes of 4 and 5 year olds many times. Often, the children don’t know how to blow without spitting. Any tips? Saliva-paint monsters are a little icky!! I thought about having the children purposefully swallow before giving them the straw. Sometimes we all have a little extra saliva in our mouth, so maybe clearing that out with a swallow will help. I’m sure this post has brought many scary paint monsters into the world. love it! This is wonderful! I tried it with my kids last night. They loved it! I would love to share. That’s great! I’m so glad that you had fun with it, Elizabeth! Thanks for sharing! 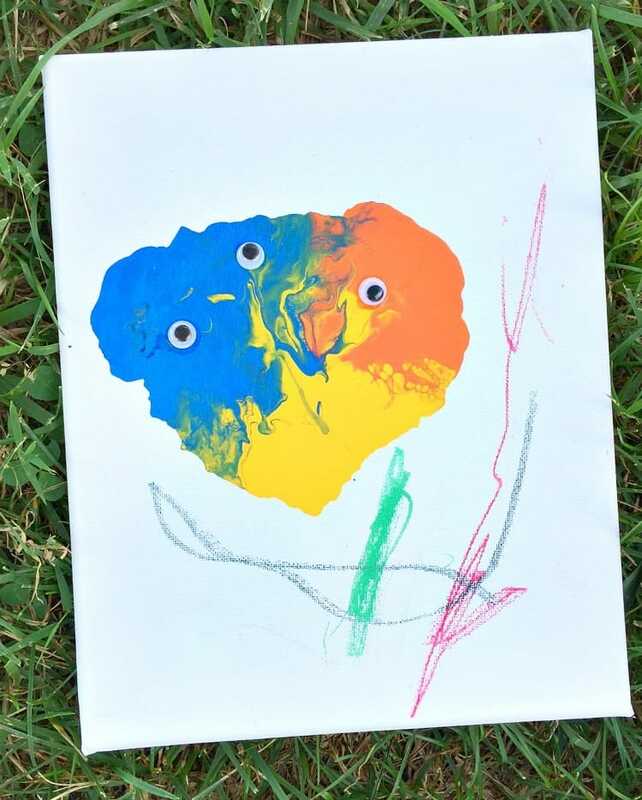 Hello, I’ve done this in the past with Kindergarteners using water color, so it blows a lot easier, however, it’s also more funny & therefore more messy. 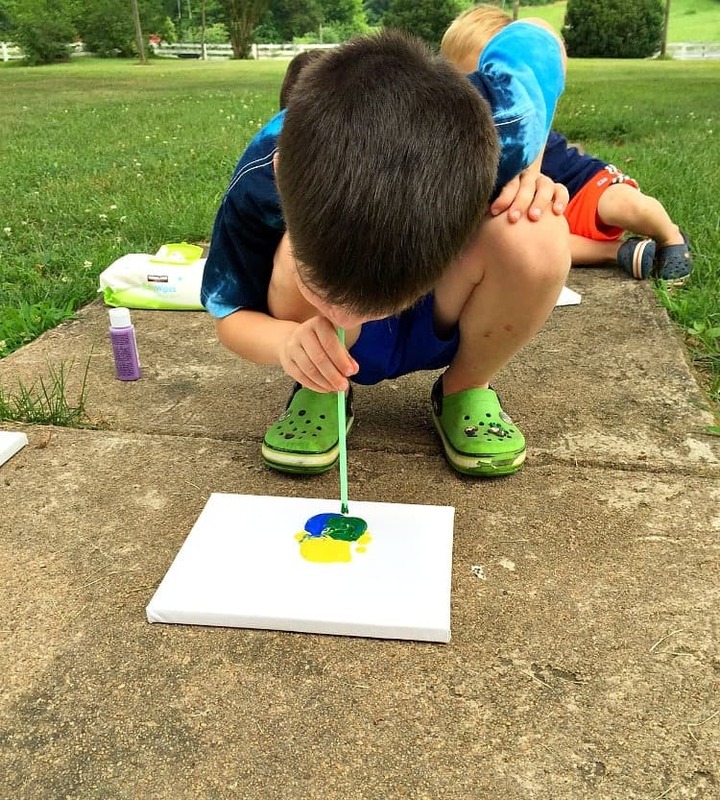 I assumed any other paint would be too thick to blow around, but your kids didn’t have any issue with this using tempura paint? This looks really fun thanks for the idea, going to try it with my son. Where did you get the little eyes from? Hey, Keith! The googly eyes can be purchased at any craft store, at the dollar store, and at many stores like Target and Walmart. Enjoy! Gaaaaaah!!!! These are so cute!!! I love them! Though kids are little their imagination power is so strong and their brain runs so fast. Thanks for your kind post, Blair!